Big ideas beget good stories. I now have one in the making. Here’s how my story begins. Yesterday, I visited Mariann Stofeel, who is currently wheelchair bound. She had a bum knee. 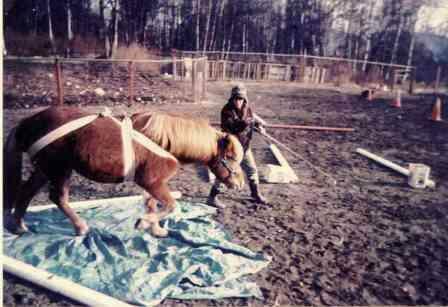 The knee gave out when she mounting Kohlfaxi, her Icelandic gelding. In the process of falling, she broke her leg. She’s been off her feet now for close to 90 days. Yesterday she called, panic stricken, and said that she was thinking that she might never walk again. We talked for a bit on the phone – I said I’d come over later in the day. is going to be integral to her getting better. Plain and simple, she’s going to have to prioritize and get her ducks lined up if she’s ever again to be ambulatory. The problem is, she generally puts the needs of others in her household before her own. So we then together, came up with a game plan. It’s deceptively simple. Big picture, weekly picture, daily plan. She is going to have to be focused and work in such a fashion, otherwise she will never again walk. In other words, she’s going to have to be both focused and decisive. I later decided to do as Mariann is doing, mainly because I’ve been feeling at loose ends career wise. The local writing center job fell through – this got me to thinking that I need to act upon something big, which is what I’m now doing. Back to the idea I had previously, which is to start an equine educational center. The cliental for this center would primarily be returning riders, which is people forty years and older. These individuals would, after a long hiatus, resuming riding. The focus would be on the use of positive reinforcement techniques. I’d rely on my TTeam training in working with these riders, and also on my centered riding/connected riding training. (Certification yet to come.) I’d rely heavily on the expertise of other instructors/teachers in having complementary clinics/training sessions. For example, I’d bring in Jane Savoie who would talk about creative visualization, and Karen Pryor, who’d do T.A.G. training with riders and horses. The question is where might I do this? I’m considering moving to Canada since my friend Rae might be wanting someone to be a property investor. Her place, outside Cranbrook, might be an ideal site. The location would be good – it’s near horse country. And the site is ideal – we could put in an arena and horse pasture. Doing the above is not at all an impossibility. I mean, I often think about the people I hear about who have and continue to do amazing things. So why can’t I be one of these people? I just need to act upon the above plan, you guessed it – by coming up with a weekly and a daily plan. This plan may change, but then again, everything might fall into place rather quickly. In my head it’s all fallen into place, so maybe, just maybe, it will fall into place in real life. Scratch the word maybe. It is going to happen.